Some tools are so common, so basic, that we take them for granted. A perfect example is the lowly tape measure. We’ve probably all got a few of these kicking around the lab, and they aren’t exactly the kind of thing you give a lot of thought to when you’re using them. But while most of us might not give our tape measure a second thought, [Ariel Yahni] decided to create an absolutely gorgeous new enclosure for his. Because if you’re going to measure something, why not look good doing it? A CNC router is used to carve the body of the new tape measure out of a solid block of wood and cut a top plate out of clear acrylic. [Ariel] then used an angle grinder to cut off a small section of steel rod which he secured into a carved pocket in the base using epoxy. Finally, the internals of a commercial tape measure were inserted into this new enclosure, and the acrylic top was screwed down into place. [Ariel] has made the DXF files for this project public for anyone else who wants to carve out their own heirloom tape measure, though it seems likely the designs will need some tweaking depending on the make and model of donor tape measure. 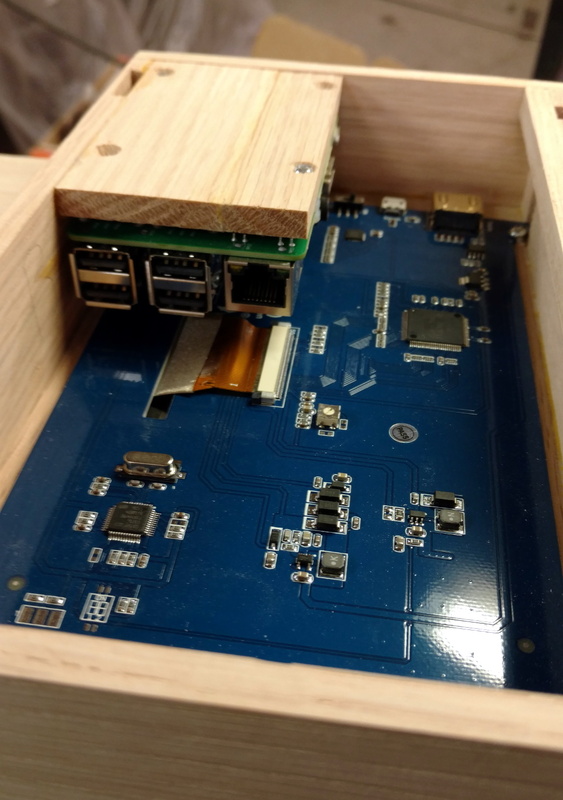 While this might not be the most technically impressive project to run on Hackaday, it’s still a fantastic example of the sort of bespoke designs that are made possible with modern manufacturing methods. 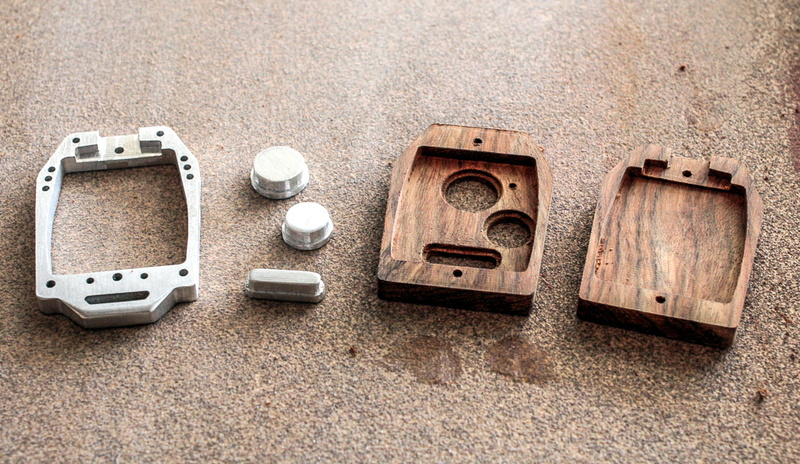 This design reminds us of a similar project to turn a basic Honda key fob into a true conversation piece with the addition of some CNC’d hardwood and aluminum. We always look forward to the builds [MakerMan] sends in, and it’s not just because we dig his choices in royalty free music (though it helps). He always manages to put together his projects with a minimum of fuss, and perhaps more importantly, a minimum of funds. His builds use salvaged components, easily sourced materials, and common tools. Watching him work invariably makes us realize that we tend to overthink our own projects. In his latest video, [MakerMan] was tasked with building a downdraft table for a local factory that makes jewelry boxes. 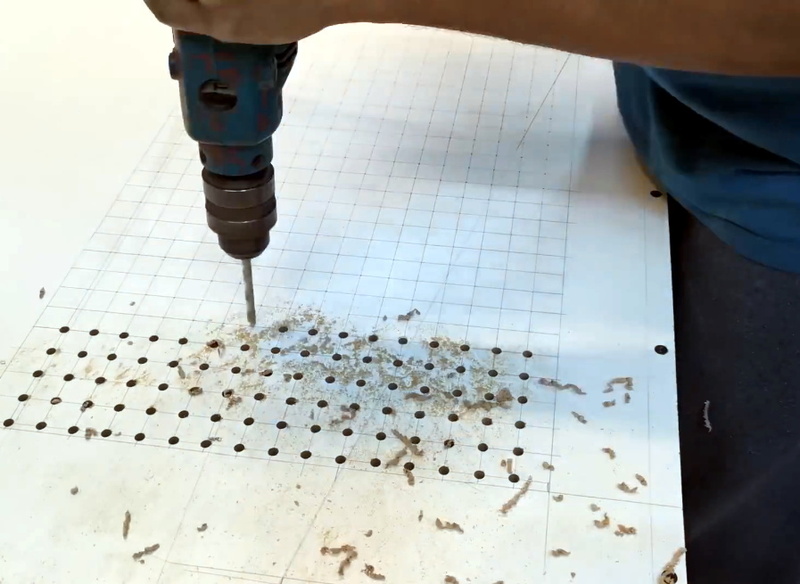 By sucking air through a series of holes in the table’s surface, sawdust created while the workers are building the boxes will automatically be removed from the workspace. 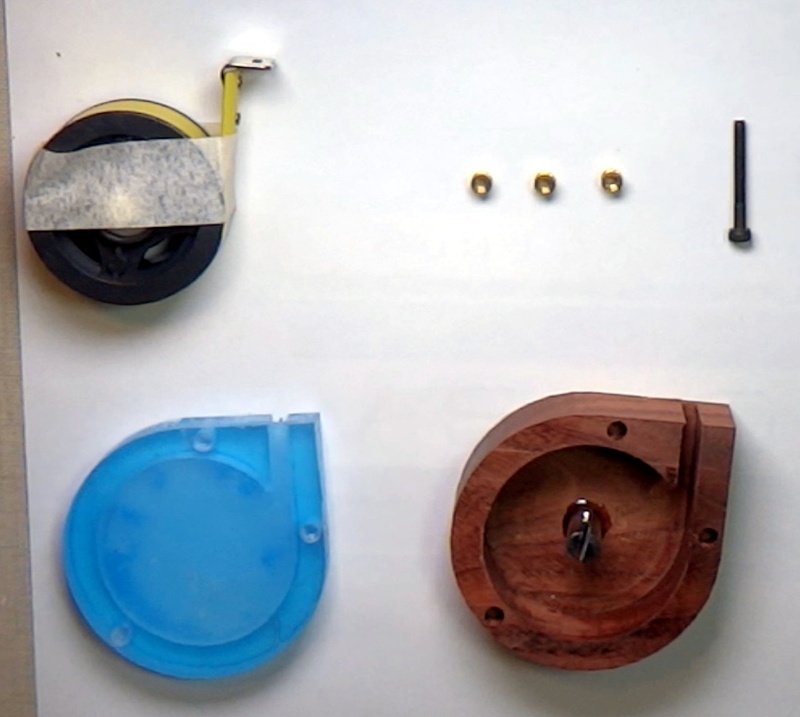 Even if you aren’t in the jewelry box making business, any task which produces fine particles (such as sanding) could benefit from such a setup. You probably won’t need a downdraft table quite as large as the one he builds, but the principles will be the same if you get inspired to build a somewhat smaller version. The build starts with sheets of MDF, which get cut, glued, and screwed together to make the basic tabletop shape. To this, [MakerMan] attaches a welded steel frame which will give it the strength MDF itself lacks. With careful measurement, lines are plotted across the top of the MDF sheet and all the holes are drilled with a simple hand drill; no fancy CNC here. With the table doing its best colander impression, [MakerMan] adds an air box to the bottom which is similarly made of thin MDF sheets. All of the joints are sealed up with caulk, because at this point you want things to be as air tight as possible. A large blower is attached to the bottom, which gets piped to a dust collection system that’s made of a garbage can and…you guessed it, more MDF. Watching [MakerMan] turn what’s often literal trash into a functional build never gets old. We’ve seen him create everything from a gorgeous origami chandelier to a very impressive diode laser cutter using little more than scrap parts and hand tools, and we can’t wait to see what he comes up with next. Now that nearly every car on the road comes with an electronic key fob, people are desperate to find ways to repair these indispensable little gadgets without coughing up potentially hundreds of dollars at the dealership. There’s a whole market for replacement shells which you can transplant your (hopefully) still functional electronics into, but if you’re going to go through the trouble of putting the electronics into a new case, why not make it special? That’s what [Michicanery] was thinking when he decided to build his own custom key fob. The end result is an utterly magnificent feat of engineering that’s sure to be a conversation for the life of the vehicle, if not beyond. Made of wood and aluminum cut on his OpenBuilds Lead CNC 1010, this build just might inspire you to “accidentally” drop your existing fob from a great height. Oh no, what a shame. [Michicanery] starts by disassembling his original fob, which is the type that has a key integrated directly into the device. This meant his replacement would need a bit more thought put into it than a separate stand-alone fob, but at least it wasn’t one of the ones where you have to stick the whole thing into the dashboard. To make sure the build was strong enough to survive a lifetime of being turned in the ignition and generally fiddled with, he cut the central frame and buttons out of 1/4″ thick aluminum. The top and bottom of the fob were then cut from Chechen wood and then chamfered on a table router so it felt a bit better in the hand. He applied oil to the pieces to bring out the natural color and grain of the wood, but not before engraving his own logo onto the back of the case for that extra touch of personalization. Not that we think [Michicanery] is going to have trouble identifying his keys from this point on. Like the incredible watch cases we’ve seen recently, this is a perfect example of an everyday object getting a new lease on life as a bespoke creation thanks to a custom built enclosure. Granted we’re not sure Honda key fobs have quite the heirloom potential of a good watch, but we’d still prefer it over the black plastic original.